Introduction to Camping is a great way for children not old enough to attend a full week of camp on their own to experience what camp will be like. We offer an overnight stay with all the activities one would encounter in a normal week of camp. We encourage a parent(s) to join their child(ren) so that both the parent and child know what it will be like at camp. It is a great bonding time not just with other campers but each other. Our goal is to reduce anxiety of those first time campers by providing a positive experience for our future campers in the form of a one day, one night stay. 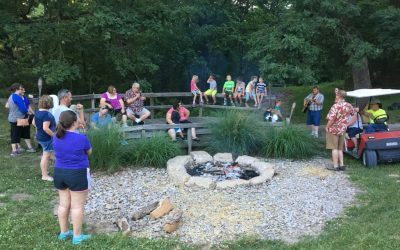 Our campers will get to experience our worship in the Chapel, meals in the Dining Hall, study sessions, recreation activities including pool time, and sleeping in the cabins overnight. If you would like more information about specific requirements or how to register for this years event, select the appropriate button. Or, you may contact us via email or calling us at 660-646-1906.